So, I’m the naughty aunt who gives out fart books for Christmas. I couldn’t help it. Farts are funny. 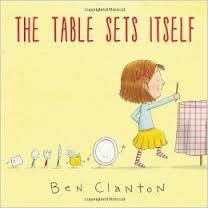 I bought The Table Sets Itself by Ben Clanton (Walker Books for Young Readers, 2013) last spring after reading its starred Kirkus Review. My daughter, close in age to the protagonist, Izzy, was similarly obsessed with setting the table. However, rather than joining us for breakfast (when we read books to begin our day), The Table Sets Itself spent its first few months here on the shelf. I’d scanned through it and the mulitgenre format didn’t appeal. 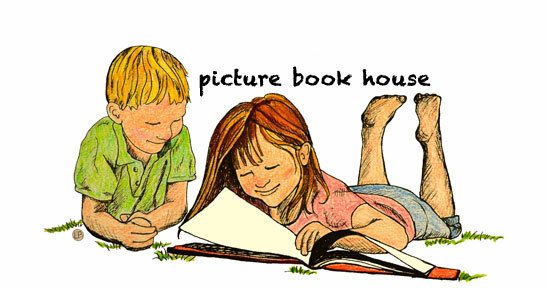 With the occasional exception, I gravitate to picture books with more traditional format and prose. The Table Sets Itself was a combination of dialogue tags, sound effects, shopping lists, handwritten font, bold font, underlined font, etc! It appeared to be a graphic novel, an epistolary novel and traditional prose. “Darn,” I thought. “Too gimmicky. This would be too hard to read out loud.” Reading dialogue tags to toddlers intimidated me. Alas, never judge a book by its layout. And always judge a book by its Kirkus review. One morning when we were feeling tired of our usual breakfast book fare, I pulled The Table Sets Itself off the shelf and set it on the table, right in between my steaming coffee cup and bowl of oatmeal. I began this blog writing about books that my kids asked me to read again, and again, and again. I have read these five words: “toot! ew! cut it out!” a “BAGILLION” times. I can be on the second to last page of the book and STILL get asked to go back to THE TOOT. The rest of the book, if you get a chance to read it, is that funny too. Izzy’s temperament and creativity are spot on. The rest of the book follows Izzy’s journey to find her lost friends. “Where is the universe were Dish and Spoon?” we read, and we see Izzy looking out her window through a telescope at the cow jumping over the moon. Clanton didn’t need to try to blend the nursery rhyme into the text. They subtlety of its illustrated presence is entertaining for adults and a perfect prompt for kids to sing it out on their own. Finally, Izzy gets a letter from Dish and Spoon. They are on a worldly adventure, sending snail mail updates from France, Italy, China and Greece. There are more puns. There are tidbits of multicultural culinary customs; there are dynamic, engaging mulitgenre illustrations that make this book just as much fun to look at as it is (when given a fair chance!) to read. Finally, with a bribe of homemade macaroni and cheese, Dish and Spoon do come home, and they’ve brought friends. “Niaho! Dish and Spoon said we should come visit. Hope you don’t mind if we STICK around for awhile,” I read. I’m with you! You can’t beat a good Toot!!! This sounds like a great read aloud!